Providing you the best range of automatic fly ash brick making machine, ash bricks making machine, fly ash bricks machine, fly ash brick machine, multi-function fly ash brick plant and chirag multifunction cement block making machines with effective & timely delivery. For our esteemed clients based across the country, we have come up with a premium collection of Fly Ash Brick Making Machine. Our in-depth domain knowledge, sophisticated facilities and skilled workforce enable us to manufacture these in different models and specifications to meet the exact application demands. We provide an exclusive range of Ash Bricks Making Machine to our clients, which are designed using latest technology. Our range of these machines is used in several industries and is available in various specifications. All the products are designed & developed under the supervision of experts. These Brick Making Machines are renowned for salient attributes like high performance, easy fittings, and high durability. Clients can avail our range at competitive prices. Our organization offers an exclusive range of Fly Ash Brick Machine to our clients,These machines are designed from quality components and are extensively used in construction and civil industries. Our valuable clients can also avail these machines in customized forms as per their specifications. Moreover, our range is highly appreciated by our clients for the exclusive designs, quality and durability features. 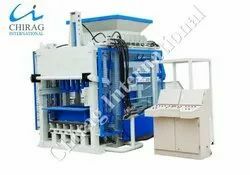 This model of machine is a full new type machine and particularly designed by our company for honeycomb type block, the rapid and equal feed is achieved by using the semi-closed reticular feeding unit, so that the product reaches the high strength. This machine is particularly suited the production of honeycomb type block. Interlock between the feeding system and the magazine, the magazine and the door are open/close automatic during feed to ensure feed quantity, the operation is reliable and suited to long term running. The vertical direction vibration is carried out by hydraulic motor drive vibration unit; the stepless velocity is down by the electric-hydraulic proportional control technology to ensure the production requirement of difference-material. Multi use; strong performance; the many kind of products with difference form and size can be made when use the difference mold, such as wall block, honeycomb type block, road block and slope block. Our organization offers an exclusive range of Fly AshBrick Machine to our clients.These machines are designed from quality components and are extensively used in construction and civil industries. Our valuable clients can also avail these machines in customized forms as per their specifications. Moreover, our range is highly appreciated by our clients for the exclusive designs, quality and durability features. Compact design and automatic control, with easy operation. Low investment brings you cost saving. Highly productive moulding device, which consists 360 rotating and compulsory feeding of raw materials, platform vibrating and compression shaping, greatly improves the cycle time. The finished blocks are of good shape and high quality. Our machines, with harmonic cooperation between mechanical, electrical and hydraulic machines functions, guarantees a reliable and high production output of concrete products. The moulds are changeable, and it is able to produce various kind of blocks,bricks,interlocks, pavers and kerbstones in different types, sizes, shapes, and colour layers. With face mix device, its able to produce pavers with colour layer. Chirag Multifunction Cement Block Making Machines We are engaged in offering a wide range of Fully Automatic Cement Block Making Machine ( This machine is Multifunctional, Could make all kinds of Blocks,Bricks and Pavers while change the moulds.) Simple structure; small occupying area; stable and reliable function and convenient maintaining; Simple manual operation enables the workers to learn fast; This machine combines many functions into one with low consumption. It is adopting with multi-valves in series, electricity discharging unit and compressing and vibrating organic combing unit to materialize the highest molding and density of the finished products.Chirag Multifunction Cement Block Making Machines Auto pallets conveying, pallets feeding and compulsive materials arranging have highly raised up the production efficiency and reduced the working intensity, while simple pallet conveying and feeding units can be installed for production. 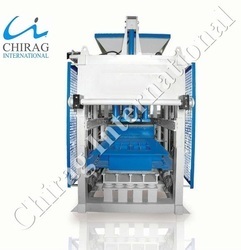 Chirag Fully Automatic Fly Ash Bricks Making Machine Target User: requires high production output of concrete blocks, in different types, sizes, shapes and colours. Chirag Fully Automatic Fly Ash Bricks Making Machine Applied Products: concrete blocks, solid/hollow/cellular masonry products, paving stones with or without face mix, garden and landscaping products, slabs, edges, curb stones, grass blocks, slope blocks, interlocks etc Chirag Fully Automatic Fly Ash Bricks Making Machine Applied Fields: widely used in buildings, road paving, squares, gardens, landscaping, city constructions, etc Chirag Fully Automatic Fly Ash Bricks Making Machine Raw Materials: crushed stone, sand, cement, lime, flyash, cinder, slag, gangue, gravel, perlite, and other industrial wastes. Chirag Multi Design Fly Ash Brick Making Machine Highly productive moulding device, which consists 360 rotating and compulsory feeding of raw materials, platform vibrating and compression shaping, greatly improves the cycle time. The finished blocks are of good shape and high quality. 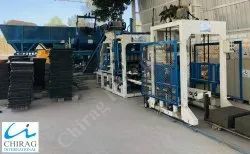 Chirag Multi Design Fly Ash Brick Making Machine The moulds are changeable, and it is able to produce various kind of blocks,bricks,interlocks, pavers and kerbstones in different types, sizes, shapes, and colour layers. Looking for “Automatic Fly Ash Brick Making Machine”?